The unique filter section of the MiniKorg is called "Traveler", it had independent frequency controls for the highpass filter (fader on top) and lowpass filter (on bottom) The lowpass had a metal tab that mechanically kept you from turning the highpass frequency lower than the Lowpass, I guess Korg hated notch filtering. Most people would file off the metal tab to get all the filter goodness. The AM8319 Diode Array VCF is a clone of the amazing velvety filter and I'm seriously thinking about buying 2 so I can recreate the Highpass, Lowpass configuration of the original. VANGELIS used this synth on almost all his music, so I must have that sound, trying to buy the original on ebay has been frustrating. Since I'm buying two I'd like to hear a demo of the module, but when I go to the AM8319 web page it has a demo of the Jupiter 6 filter! Does anyone have an audio demo of the AM8319 filter? I'm still attempting to place an order myself, since they were delayed. Hopefully soon! I think the tab on the Traveller had to do with music dealers and demos in that without it it was too easy to make the sound disappear. Some people have discovered you can mount them upside down, which doesn't look nice but lets you move the travelers freely. Alternately, especially with the plastic caps the tab can be filed down. The 700 was Vangelis' first synth, though there was only a relatively short time he heavily used it. Albums like "Appocalypse des Animaux" and "Earth" used no legit synths and by 1977 he had his CS-80. Even by "Heaven and Hell", while he plays it a fair amount, perhaps his Pro Soloist synth parts are more prominent. Kitaro is really the artist who made it's sound a long term signature. Anyone got this yet? Curious on a audio demo. I'm very excited about this module, and in fact have just registered to take part in this discussion, and...start planning my first modular! All because of this little filter. Firstly, I love the sound of the Korg 700/770/800DV family. The filter is the key to the sound. I love playing my Korg 700 wiggling the filter cutoff sliders, which provide so much colour. I thought it would be great to have a bigger synth with these filters hence my interest in starting on a modular path. However, my excitement wanes a bit when I look at the module. The reason is the cutoff knob. Personally I think this is a mistake. In fact having one cutoff in one module is a mistake too. The whole appeal of the Korg 'Traveller' is the way the sliders can be used with one hand, while I play with the other. This is not possible with having two of those filter modules (one set to LP, the other to HP). It just isn't physically possible to grab two knobs with one hand. What would be nice to see, is a another design which would use the AMSynths sliders for LP and HP cutoff in one (bigger module). 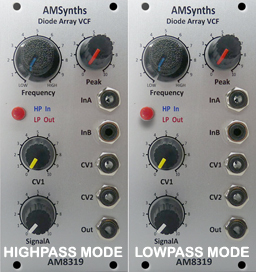 AMsynths already use sliders in their modules, so the R&D is done and components available. I think this would be a more musical design overall. What say you, the great masses of Wiggledom? Mr. AMsynths? Any thoughts? PS. I'm also surprised to see the relative lack of interest here in this thread. Are there any other Euro rack filters with the Korg sound? (asking genuinely as I'm 100% fresh meat to modular synths ). The whole appeal of the Korg 'Traveller' is the way the sliders can be used with one hand, while I play with the other. This is not possible with having two of those filter modules (one set to LP, the other to HP). It just isn't physically possible to grab two knobs with one hand. What would be nice to see, is a another design which would use the AMSynths sliders for LP and HP cutoff in one (bigger module). Indeed, part of the charm of the Traveller filter design is the physical control--it's also a limitation of it, so then many would ask for the additional features. I would love to see a dual module with sliders, that said, this is the later version of the filter, and based on the sample, seemed quite different from the Oakley Journeyman filters which I believe are based on the early version. The flexibility is nice with the Oakley, but I do find my self wanting something that resembles the Traveler's controls as a dual module. I was hoping I could get these in euro and sell my MOTM Journeymen, but I don't think they're very similar. A simpler, dual, more Traveller like, euro version would be excellent! Actually not to knock the filters, I just paid for some myself, the VCOs in my opinion are more important than generic VCOs because they sound so different. As I understand it, Korg did a square core and divides it so the saw for instance is only vaguely like a saw since its a mix of several squares in octaves. I can spot use of these early Korgs by what their higher frequency pitches sound like. Night and day different up high from say a CEM chip instrument and it's not the filter. @ndkent, I'm sure the VCOs and other things play a part, but I first loved these filters from the Korg Synthepedal and later the 800DV. 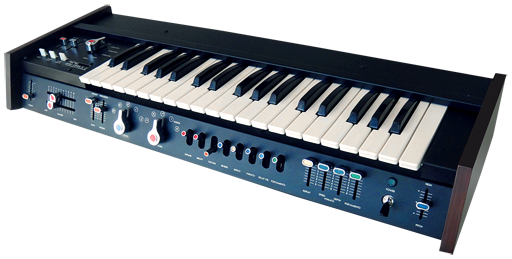 The Amsynth version demo sounded great, but seemed quite different from the Journeyman--the resonance seems to have a different behavior-hard to compare fairly without having both. It's possible in a configuration as limited as the Traveller design they could be very similar. Anyway, I don't think they would replace the Journeyman-and I need to do that to justify and pay for them. Also, the Journeyman(men?) didn't replace the Synthepedal, as I had hoped. I would love to see a simple, dual compact slider version of either revision of the filter. Actually not to knock the filters, I just paid for some myself, the VCOs in my opinion are more important than generic VCOs because they sound so different. I'm still of the opinion that the filter is the main attraction here, however, what makes that Korg sound is the filter plus the VCO plus the way the resonance and envelope amount works. These work via a toggle switch and are the key to the signature sound. I would love to be able to purchase PCBs and rare parts for this, two boards. I can't help thinking; if you want control over 2 variables with one hand, you could buy yourself an x/y kinda module for one-hand control.... like a joystick. The likes of something like this http://synthesizers.com/q182js.html must be available for Eurorack in spades. But ok... you'd need the extra module. I have the K2/700s and absolutely love its filter! Glad I found this post. I've had a K2 for many years and absolutely love the filter design. It just so happens that I have many (or all) of the parts necessary to build a faithful clone (since I repaired a few for customers and one for myself). I was wondering if anyone else had built a replica of it (for modular). Regardless, I've already started on a modular version (re)design of the original Univox Mini-Korg filter. Can't wait to prototype it and see if it is reasonable to build multiple. At a minimum, I'll have at least one that I can showcase. Vintagesynthlab, did you make any progress with this? I'm currently rack mounting a 700S into a 3µ rack, adding proper CV/gate on it and another 700S, and the same for a Maxikorg [K3]. When done.. should be able to do 4-voices! Clearly it's one of my favorite synths, ever. That sounds great! Despite the amount of work, I'm sure it'll be well worth it. Those old Mini/Maxis are fantastic sounding. It took a while to get it properly adapted to Eurorack.